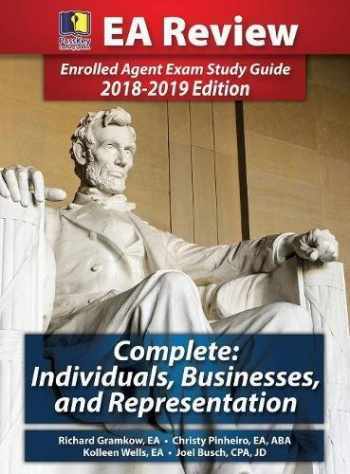 Acknowledged author Richard Gramkow wrote Passkey Learning Systems EA Review Complete: Individuals, Businesses, and Representation: Enrolled Agent Exam Study Guide 2018-2019 Edition (Hardcover) comprising 906 pages back in 2018. Textbook and etextbook are published under ISBN 0999804308 and 9780999804308. Since then Passkey Learning Systems EA Review Complete: Individuals, Businesses, and Representation: Enrolled Agent Exam Study Guide 2018-2019 Edition (Hardcover) textbook was available to sell back to BooksRun online for the top buyback price of $56.98 or rent at the marketplace. This 3-part study guide is designed for test-takers who will take all their exams in the 2018-2019 Prometric EA Exam testing window (May 1, 2018 through February 28, 2019).Learn how to become an Enrolled Agent with PassKey's comprehensive EA Review study program, newly-revised and thoroughly updated for the current tax year. More than 800 targeted study questions and answers prepare you for the EA exam offered during the May 1, 2018, to February 28, 2019, testing window.This year's edition includes the sweeping last-minute tax law changes of the Tax Cuts and Jobs Act (TCJA), which was signed into law on December 22, 2017 and included several retroactive provisions. This study guide also includes including coverage of the recent court decision of Steele vs. United States of America, which affected the regulation of tax professionals. All of these new tax law updates have been included in this volume. This is an in-depth study guide for all three parts of the IRS Enrolled Agent exam. Using simple-to-understand language and numerous concrete examples, this study guide helps demystify complex tax law. This complete study guide covers the following: Part 1: Taxation of individuals. Part 2: Taxation of businesses, including partnerships, corporations, sole-proprietorships, farming businesses, exempt entities, estates, and trusts. Part 3: Representation, practice, and procedures. PassKey EA Review Complete has been rigorously vetted for accuracy by experts in the tax profession. For more study help, PassKey Publications also offers a six-part practice exam workbook with detailed answers and explanations, so you can test yourself, time yourself, and learn!